God’s wisdom and generosity are manifested through our body’s tremendous capacity to nurture, heal and regenerate and nature’s rhythm and abundance. When we nourish our body with natural foods, we not only heal our bodies but the environment as well. What poisons our body poisons the earth. Our food choices affect the world: tropical rainforests are destroyed, animal species become extinct; rivers, seas and oceans are polluted if we eat foods that are artificially grown through the massive infusion of synthetic hormones, antibiotics, preservatives, and chemical pesticides and fertilizers. Nurturers of the Earth is a a support group for vegetarians and vegetarians-in-progress that I organized with Marites Maunahan-Sobeng and Pamela Yap-Magallon. Coming from very diverse backgrounds, we have the same health history, we were all sickly. Pam’s mother died when she was only 5 months old. She was bottle-fed until the age of 4. A picky eater, she didn’t eat vegetables and fruits. Instead she gorged on canned/preserved foods, junk foods, sweets, milk formula, flavored juices and meat. Fat but very sickly, she spent her weekends in different doctors’ clinics. In her teen-age years, she reduced weight the wrong way. She would eat one meal a day and only consumed foods that which would satisfy her palate. She became very thin, almost anorexic. As a married career woman, she would buy easy-to-prepare foods to cook for her husband. When she got pregnant with my first child, she did not listen to good advice and still ate the same junk foods. She gained 40 lbs. and experienced a very difficult pregnancy and child birth. She was finally awakened when her conscience bothered her that what she ate affected her first child’s health whom she was breastfeeding exclusively. Every time she ate processed foods, her son Iezer would get cough and colds and she would feel very guilty. For the sake of her son, she did an instant turnaround from an unhealthy and meat eater to a vegetarian. Her officemates were so surprised to see a different Pam return to the office. Pam used to work in one of the top multinational advertising agencies. As a part of her job, she was advertising foods and drinks that she herself has stopped using. She just based the campaign strategies from research and consumer insights. Even though she was still effective in her job, guilt again got the better of her. She was advertising commercial products to consumers and yet she was preaching about breastfeeding and indigenous food to people whom she knows. She left advertising to set-up her own events company and helped establish Nurturers of the Earth. For Tes, nothing in her background had indicated that she would ever have such a drastic shift in outlook and lifestyle. Her favorite foods had been those typical of a young Filipino girl – chocolates, cakes, kare-kare, dinuguan, goto, etc. In her teen-age years, she remembers the frequent visits to a dermatologist because of severe acne. She also took medications for bouts of migraine. I met Tes in a breastfeeding seminar in October 2000 while she was seven months pregnant with her first child. That was when she started to change her lifestyle. With that decision, she gave up using ground pork and beef for her cooking, as well as all dairy products. She completely eliminated the use of artificial flavorings and monosodium glutamate. “My friends used to joke that my kitchen cabinet looks like I am a stockholder of seasoning cubes with beef, pork, chicken and shrimp flavors in complete supply.” Now my shelves contain beans, nuts, herbs, whole wheat flour, unpolished rice and other natural foods,” she beams. “I breastfed my son Karl until he was almost five years old, feeding him vegetarian foods. He did not have any single bout of illness that required hospitalization except when he had diarrhea because was mistakenly fed with vegetables with bagoong by the yaya. My mother named me after St. Raymond Nonnatus, the patron saint of pregnant mothers. Little did she know that supporting pregnant and breastfeeding mothers would become my passion in life. I started with dreams of becoming a broadcast journalist and took up Mass Communication at the University of the Philippines Diliman (UPD) in 1979. At the UPD, I realized that the media under the Marcos regime was heavily censored and I lost interest in working for it. Like many other UP students who heeded the call of the times, I opted to go the countryside to “serve the people”. I worked with the Rural Missionaries of the Philippines as a lay assistant in Isabela until I married in 1987 and gave birth to a baby girl in 1988. Reared in a home whose fondness for dairy products was almost insatiable, my family also ate a lot of processed foods. My father worked in a famous ice cream company so we had lots of milk and ice cream in the freezer. When he worked abroad for several years, my father flooded us with pasalubongs of chocolates and canned foods. My father complained though that his homecomings should include an itinerary to the hospitals or doctors’ consultations because I was almost always sick. We did not know then that the food we ate caused the illnesses. Due to severe backache since childhood, there were times that I felt like a beauty pageant contestant. Only, I had to pose a lot of times front view, back view and side view before an x-ray machine. I used to take a lot of antibiotics and endured hospitalizations. But still the illnesses kept on recurring. I became interested in studying about health in preparation for motherhood by reading a lot of books and underwent trainings on birthing, breastfeeding, natural fertility management and natural healing. After a beautiful non-medicated birthing experience, I exclusively breastfed my child and gave her only natural foods. In 1991, during the growing-up years of my daughter, my family lived in Baguio. That was where my daughter and I became vegetarians. My husband got into the lifestyle five years later when he contracted rheumatic heart disease. I had several projects with Plan International Baguio, one of which was to help farmers grow vegetables organically so I had no problem sourcing chemical-free vegetables. When I went back to work, I served in human rights and disaster response NGOs as an information officer then decided to volunteer my services with ARUGAAN from 1996-2003. During this period, I specialized on infant and young child feeding by participating as a trainer and speaker in conferences both here and abroad. My work involved promoting, protecting and supporting breastfeeding and encouraging parents to use indigenous healing foods. As a licensed massage therapist, I gave lectures and trainings in these conferences on how to facilitate birthing and breastfeeding through massage and natural healing. Pam and I met through ARUGAAN, a support system for women with young children. I was invited to talk about breastfeeding in a child birthing class where she was one of the enrollees. Tes attended an ARUGAAN seminar I organized on “Infant and Young Child Feeding during Emergencies” intended primarily for social workers. “I asked our driver to bring me there and told him to wait because I was just planning to show up and leave. Ayun! I stayed the whole day and even came back the next day,” Tes related. Pam’s three sisters-in-law also succeeded in breastfeeding their children. “One of my sisters-in-law and her son were even got cured of their asthmatic attacks when they started using food as medicine that Nona explained to them”, said Pam. The babies and kids in our families are all eating brown rice and they are thriving well. They are not only healthy, they are also amazingly intelligent. The World Health Assembly recommendation of feeding the child using indigenous foods came out only in 2002 but we were practicing this for a long time now. Our projects include holding natural parenting classes that tackle lessons on natural childbirth, breastfeeding, cooking demo featuring recipes on indigenous vegetarianism, elimination communication, and other ecologically sound ways of nurturing. We educate parents that instead of buying expensive cows’ milk and milk formula that can trigger allergies and cause serious illnesses, their children can get enough calcium and other nutrients from an all-vegetable diet. Moms and future mothers call us and get help on breastfeeding and vegetarianism. In line with my profession as a lactation consultant, I also practice as a childbirth coach and has helped many mothers deliver their children and initiate breastfeeding. Nurturers of the Earth started offering lectures and Mother Nature Wellness Programs to corporations. It is our way of sustaining ourselves so we can continue our work in providing trainings to family health counselors at the community level as we go around the country teaching the earth-friendly lifestyle and natural healing in the provinces. Corporate response is very encouraging. With so many people getting sick and dying of cancer, many people are interested to learn about natural healing and cancer prevention. As an events specialist, Pam organizes events that are not just fun but very informative as well. Her bridal showers include counseling on an earth-friendly diet and natural fertility management while baby showers include breastfeeding and parenting lessons. During school tours, we create entertaining ways to teach kids to love and care for the animals by celebrating Animal Day. We also serve delicious earth-friendly foods during birthday parties. Aside from handling events and parties, we write articles for parenting magazines. Topics revolve around empowering one’s self through information, breastfeeding, indigenous foods and natural healing. Tes provides financial planning services and teaches parents on how to save on food costs “so they don’t need to spend on medications and vitamins as well. Parents can save a lot and spend on things that will create a better quality of life for them like family outings, books, educational plans, etc.” She also now sells natural toys for children. 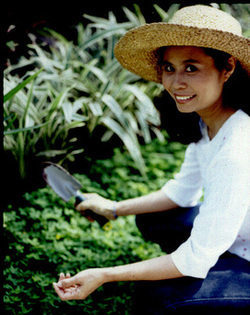 Nona D. Andaya-Castillo, IBCLC is a teacher of natural family planning, natural childbirth, indigenous vegetarianism, natural healing that uses massage and food as medicine and is the only non-medical doctor who passed the accreditation for International Board Certified Lactation Consultants in the Philippines. She has rehabilitated severely malnourished children, helped breastfeeding mothers and many others heal from their illnesses through the use of indigenous foods. She founded Nurturers of the Earth, a support group for vegetarians and vegetarians-in-progress. The group conducts fellowships of vegetarians, school and organizational tours, classes on healthy lifestyle, natural parenting and indigenous vegetarianism. Call +63915-3999992 or (632) 218-7777.